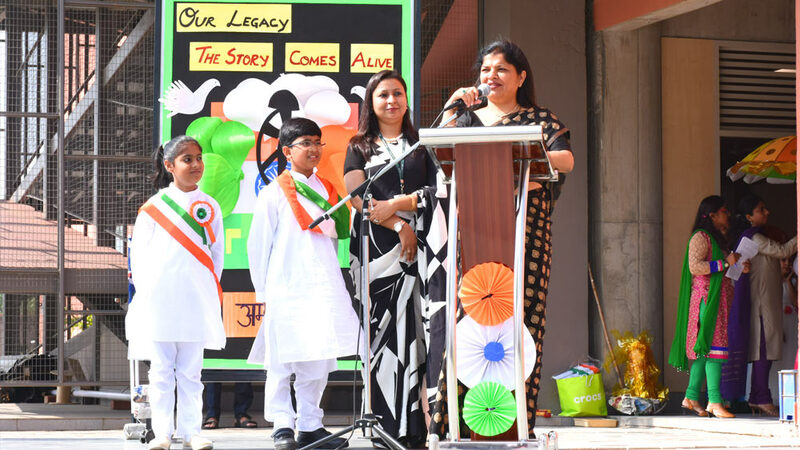 With the aim of nurturing the artistic aptitudes of our students, Delhi Public School, Sector 84, Gurugram, organized their first Talent show ‘Our Legacy-The story comes alive’, for the students of Grade III to V, on 5th September, 2017, in their school grounds. On this delightful occasion, the students showcased their skills and brought out their undiscovered talents. The show began with the journey into India’s Independence and highlighted a few incidences from that period of Indian history. Glimpses on the sentiments of the Indians on the widespread turmoil in India, the selfless goals of our leaders, their ideologies, and spreading awareness on unity and harmonizing the manpower by holding meetings of different groups across the country, were some of the scenes enacted. The parents caught a fleeting sight of ‘Jallianwala Bagh incident, Dandi March and Swadeshi movement, which were instrumental in the struggle for freedom. The magnificent models of our heritage -Tableau on Mahabodhi Temple, Sanchi Stupa, Taj Mahal, Qutub Minar, Parliament House and India Gate, representing the Ancient, Medieval and Modern Indian history, were an added attraction of the entire show. They were much appreciated by the parents for their artistry and grandeur. It was truly a wonderful show.